The subject of wind energy and wind electric conversion systems is incredibly complex. The information on this page will barely scratch the surface! "I'm not pessimistic about wind power, just incredibly realistic!" The first windmill for electricity production was built in Cleveland, Ohio by Charles Brush in 1888. By 1908 there were 72 wind generators in use, ranging in size from 5 kW to 25 kW. By the 1930's and 1940's, hundreds of thousands of wind electric turbines had been built in the U.S.
operated radio receivers and a few light bulbs. In 1985 oil prices dropped, the tax credits expired and the small wind industry was in limbo once again. awareness of and demand for renewable energy solutions. The small wind industry is back! practice our own personal energy policy and help improve our little corner of the world! helps put it all into perspective. opposed to manufacturer's claims) is rapidly becoming the standard for determining a turbine's rated power. (mass and momentum) so indirectly it's all solar energy! 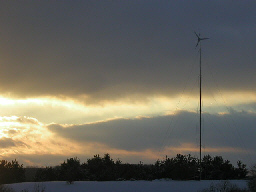 The wind turbine converts the wind's kinetic energy into electricity. to accomplish this. Once the electricity leaves the turbine via the "down tower wiring,"
where it goes next is determined by the type of system it's connected to. home or out onto the utility grid, depending on the following conditions. increases, the turbine power production increases, reducing the amount power purchased from the utility. may be found on our Net Metering Page. turn provide standard 120/ 240 volt AC current for the home's appliances. For a more in-depth explanation of how off-grid systems work, please visit our Backup Power Page. when you need the water most, just the opposite of solar energy. 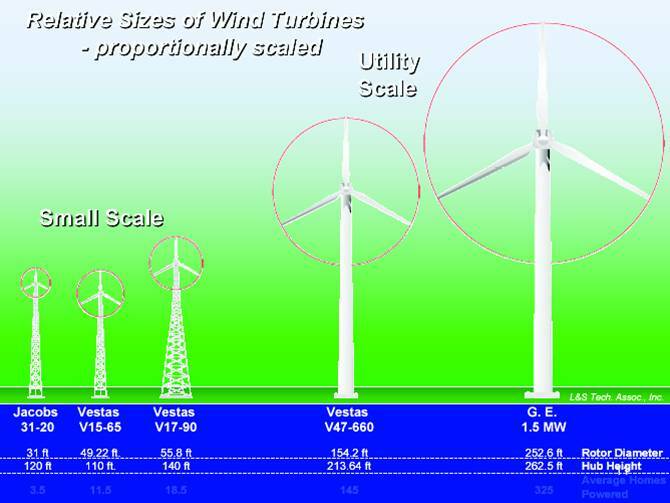 * Not all turbines are created equal! They are man made and have moving parts…buyer beware! want... expensive lawn art or a reliable, cost-effective, long term investment? 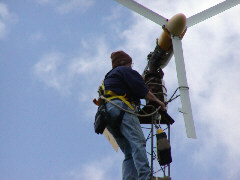 perform properly, so why expect that from your wind turbine?? that adds up to a lot more energy produced and a much better return on your investment. FYI: Betz's law states that the energy content of the wind varies with the cube of the average wind speed. Simply put: double the wind speed and you increase the energy 8 times. Tower height is critical!! 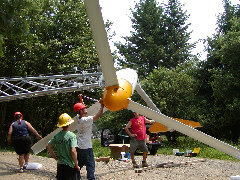 will also stress the machine and tower, increasing the maintenance and decreasing the turbine's lifespan. if those obstructions are young trees! assembly into place. The 100' and 120' versions are the most popular. consists of pipe or tube held together with couplers, with guys at each coupler. 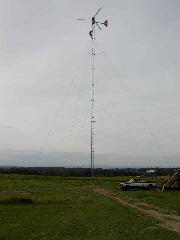 A gin pole provides the leverage for raising/ lowering via a tow cable and pulley system. The tow cable is pulled with a winch or tow vehicle. 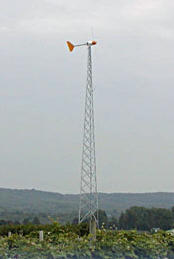 The self supporting 3 legged tower is the industry standard for turbines 10KW and up. the most expensive. 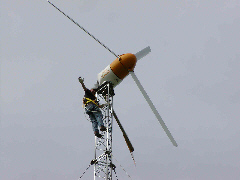 When used with the larger turbines, it is still a cost-effective option. standardized zoning ordinances. Each municipality has it's own unique zoning and land use regulations. wind projects stall at this point due to zoning and permitting barriers.